As for the guitar, she’s hardly had it out of her hands since the age of 13. That was when her mother finally relented to Sheryl’s begging for a Harmony Strat from the J.C. Penney catalogue. Though Sheryl was a rock-star wannabe, the influence of her pianist mother got her obsessed with learning harmony, and her first teacher in Pittsburgh, John Maione, introduced her to the guitar tradition—Wes, Jimmy Raney, George Van Eps, Joe Pass and others. She eventually attended Berklee College of Music. Her years of dedication and focus won her 3rd place in the Thelonious Monk International Jazz Guitar competition in 1995, and she was chosen as a Jazz Ambassador for the U.S. State Department in 2000 for a South American tour. She is now said to be “One of the top players in an emerging generation of jazz guitarists” (John Heidt, Vintage Guitar). Her own trio, the Sheryl Bailey 3, is a modernized version of the organ trio—“the ultimate organ trio” according to JazzInside Magazine. In addition to their 15-year plus residency at NYC’s 55 Bar, they have toured China, Canada, Europe and the US. She also tours the world as a member of David Krakauer’s “Ancestral Groove.” A partial list of others with whom she has performed and recorded with includes Richard Bona, George Garzone, Lincoln Goines, Kim Plainfield, Bill O’Connell, Mike LeDonne, Irene Cara, Lea Delaria, Jack Wilkins, Howard Alden, Shingo Okudaira, Ingrid Jensen, Dwayne Burno, Tommy Campbell, Simon Woolf, Alex Garnett and Ken Peplowski. To date, Sheryl has 9 CDs out under her name, and a live DVD, “The Sheryl Bailey 3 Live in NYC”(Mel Bay). Sheryl is a Professor at Berklee College of Music, and at the Collective in New York. In keeping with Sheryl’s philosophy of “giving back”, her 2011 quartet release, “For All Those Living” donates 20% of sales to the Ronald McDonald House of NYC. She has been an Artist in Residence at countless other programs, including NYU, Bates College, the Stanford Jazz Workshop, Towson University, the LA Music Academy and GIT. 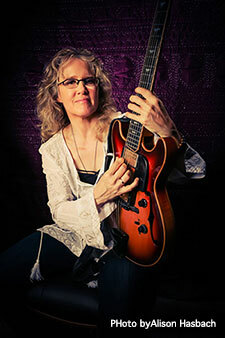 In 2009, Mel Bay published her book “Moveable Shapes: Concepts for Re-Harmonizing II-V-I’s.” She has also developed a complete curriculum in jazz improvisation for interactive cyber study via Truefire’s Guitar Sherpa program, “The Bebop Dojo.” In addition she has top selling courses available from Mike’s Masterclasses, Jazz Guitar Society, JamPlay, and Truefire.